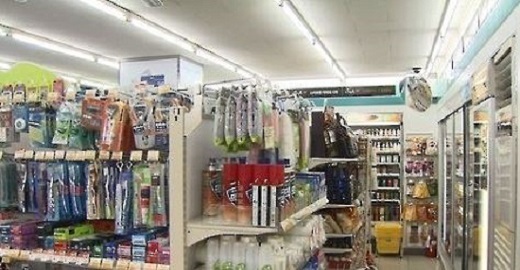 The number of convenience stores are on the rise, and is likely to continue to increase despite slackening profits from an overcrowded market, industry watchers said Tuesday. South Korea had 34,376 such stores as of the end of last year. With the country's population counted at approximately 50.12 million, it translates into one store per 1,491 people. This is 1.5 times more than neighboring Japan, where the industry took root long before South Korea. Japan has one store for every 2,226 people. South Korea's first convenience store, Seven Eleven, opened in May 1989 in southern Seoul. It has now replaced department stores and giant retailers as the place to shop as the country's society ages and one-person households replace big families. Data showed that industry leaders continued to increase their size, opening more than 3,000 new stores this year up to last month. CU had the most stores with 11,949, followed by GS25 with 11,911. Seven Eleven had 8,944, and Ministop 2,401. E-mart 24 counted 2,247 shops. Despite the numeric boom, profits at the convenience stores are shrinking. At GS Retail, the operator of GS25, for example, second-quarter operational profit fell 21.7 percent to 53.1 billion won ($46.99 million). For convenience stores alone, operating profit fell 5.8 percent to 64.2 billion won. Industry watchers say stores will feel the pinch more when the minimum wage is increased next year. More store openings are expected, nevertheless, with many neighborhood supermarket owners wanting to switch their business to convenience stores. Industry observers expect this development will cause the number of new convenience stores to go up for another four to five years.